I was first licensed in 1972 when I got my Novice ticket as WNØHUS. I upgraded to General in 1974 and became WBØHUS, upgrading to my Advanced ticket in 1977. After I passed the Extra exam in 1998 I applied for the vanity call NØJY in March of 1999. 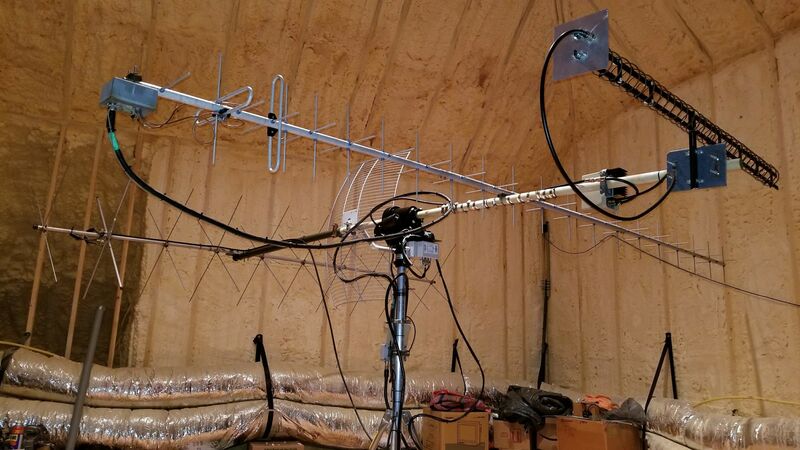 My amateur radio interests include working the satellites, DXing and VHF packet. Being that my XYL KD5FCQ is from Colombia, in 2011 we went to the Ministry of Telecommunications in Bogota, Colombia to apply for my Colombian amateur radio license and I now also hold the call HK5JY. One of my greatest thrills in amateur radio was a contact I had with John Blaha, KC5TZQ when he was aboard the Russian Mir space station, in January 1997. I was mobile, on my way to work when Mir came up over the horzon and John was there calling CQ! I retired from BNSF Railway at the end of March 2013 and I now devote my hobby time as Vice President - Engineering for AMSAT-NA and as District Radio Officer for Texas State RACES District 4 Hurst. 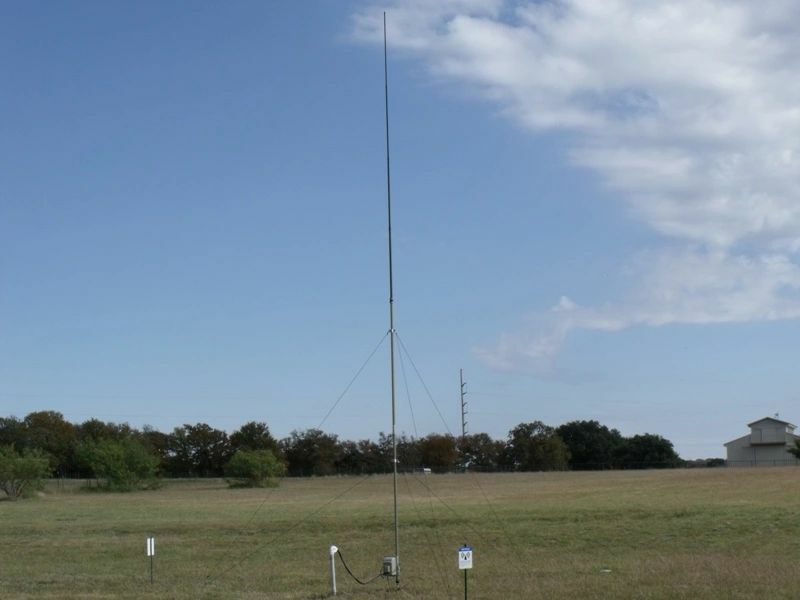 I am also a member of Hood County RACES, Hood County ARES, and a member of the Hood County Amateur Radio Club. My XYL (KD5FCQ) and I live about 3 miles northeast of Granbury TX, which is about 30 miles southwest of Fort Worth. The satellite antennas, Cushcraft 20 element V band antenna set for right hand circular polarization with a Landwehr preamp; homebrew 31 turn right hand circular polarization helix (modeled after the VE3NPC array design, click here for the PDF) with an SSB Electronics UTM 1200 DLX 15 watt upconverter for L band; KLM 40 element U band antenna with switchable polarization and an SSB Electronics SP-7000 preamp; K5GNA modified downconverter with BBQ dish for S band with a homebrew RHCP patch feed. Another look at the satellite antennas. Yes, they're in the attic! 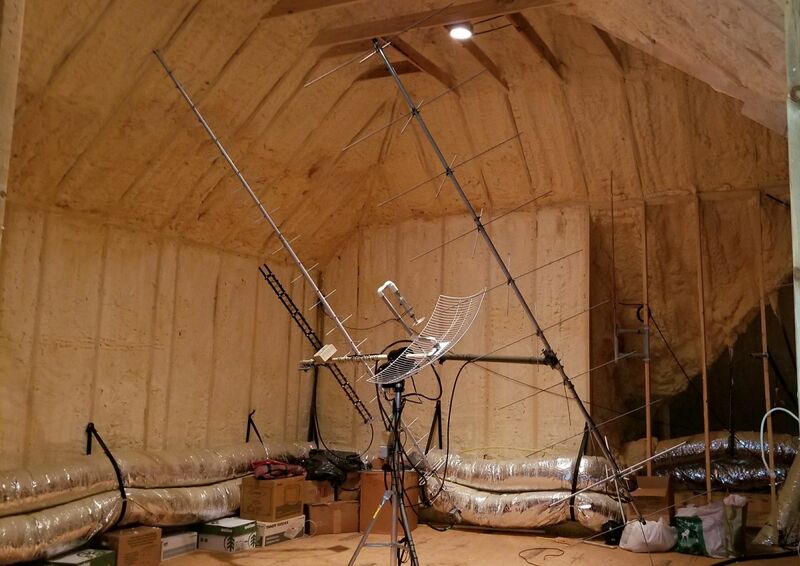 I specifically had the architect design an area in the attic at our new QTH to hold these antennas and clear the walls and ceiling at any az/el position. 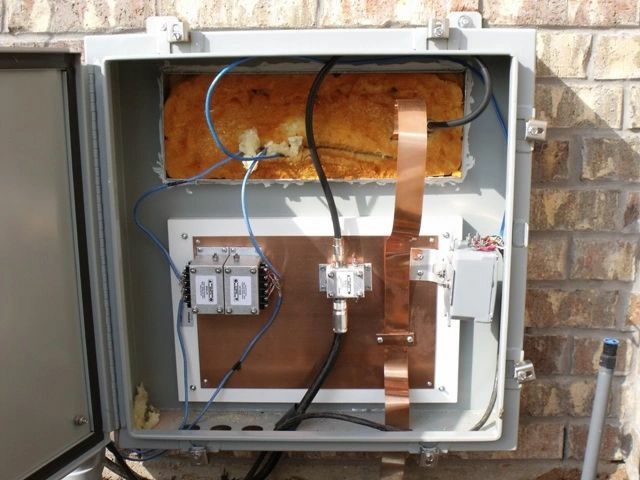 The house is encapsulated in foam insulation, so there is no metal between the antennas and the outside. Just a bit of wood and shingles. 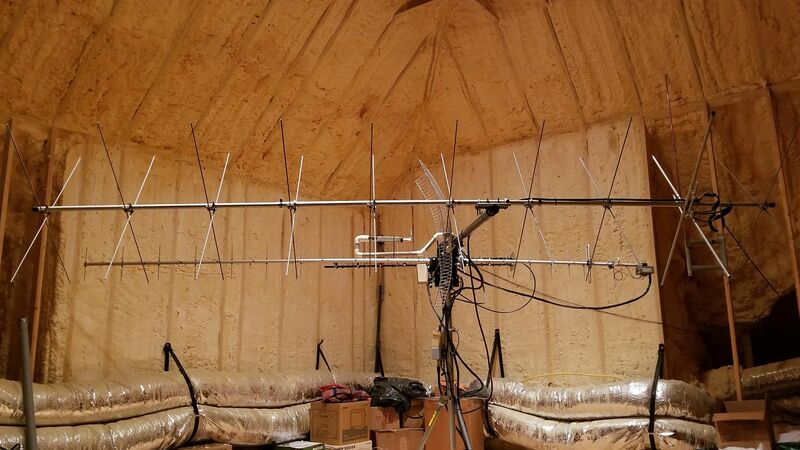 The antennas do very well from the attic, the insulation has very little (no noticeable) effect on the frequencies up to 450 MHz. I can work repeaters as well as if they were mounted outside at the same height. Repeaters 50 miles away are no problem with 5 watts from the FT-817! My HF antenna is a SteppIR BiggIR with the 80m coil, with 48 radials each 70 feet long. I have been using it since September 2010 and my impression is very favorable. It is the first vertical antenna I have owned, and I can only subjectively compare it to my last QTH where I had a Mosley PRO67-C at 100 feet. DX with the SteppIR is just as good, and local (intrastate, e.g. nets) work is good as well. 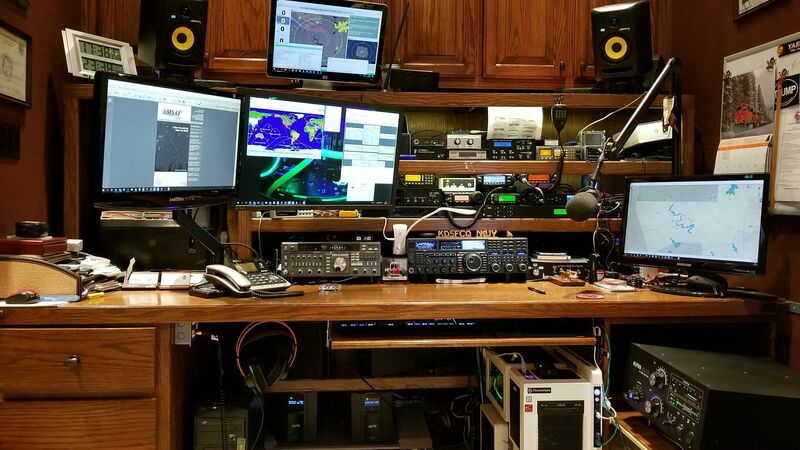 All in all, while it's entirely subjective, I would say that it does an excellent job with DX (my favorite HF activity). Having had the tower at the previous QTH I do not feel that I have given anything up (on HF) with the new SteppIR vertical. A closeup of the LJE radial plate. I won the plate as a door prize at Hamcom many years ago. I would recommend it to anyone looking for a radial plate. I appreciate the way the screws easily tighten down on the ring connectors. I have 48 radials, each 70 feet in length. I used (mostly) 14 gauge radial wire and the 6 inch metal staples from DX Engineering, and would recommend them. LMR600 coax feeds the antenna from the SPGP, about a 150 foot run underground. 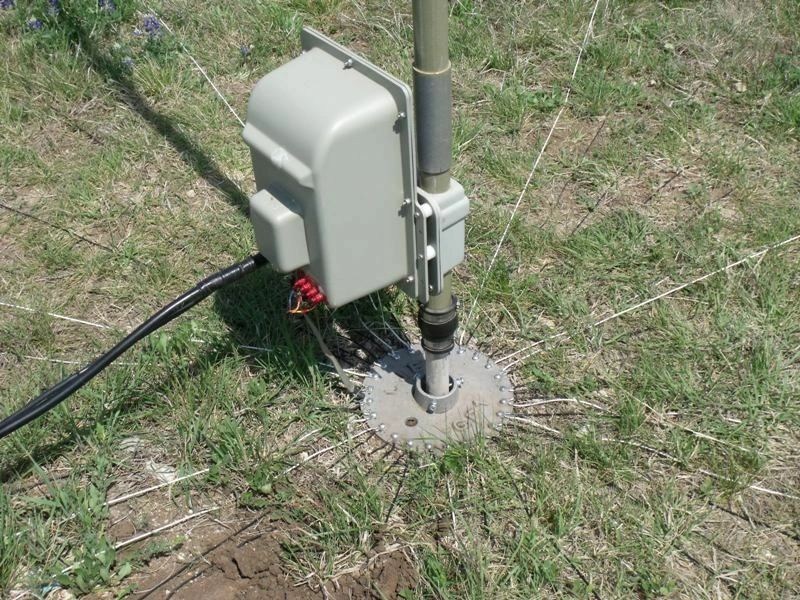 A look at the single point ground panel for the antenna and weather station cables. The ground is bonded to the electric service panel ground with 1 1/2" copper strap. The 1 1/2" copper strap runs under the slab with 8' ground rods spaced 16' apart, to the electric service panel ground. It was nice to be able to take advantage of building a home, to be able to allow for some good grounding. I have many videos of our AMSAT satellite projects, and of amateur radio and my other interests on my YouTube channel. You can also watch live streaming video as we work on the (currently) Fox-1 satellites, on my Twitch channel. In support of our local Skywarn and simply for fun, I maintain a weather station with a 2 meter APRS connection using the Byonics WXTrak (NØJY-4 on findu.com) as well as a display of the weather on my weather web page so the current weather readings are always available to interested parties in our area of Texas. Copyright © 2018 Gerald W. Buxton, III - All Rights Reserved.